"In Moscow the special English aesthetic has been retouched, this parallel scenario has lost its dramatic distinctness"
Sergei Polunin, the famous disappearing-act of ballet, disappeared yet again last week from his latest company just before starring in the first Russian performances of Kenneth MacMillan’s Manon. 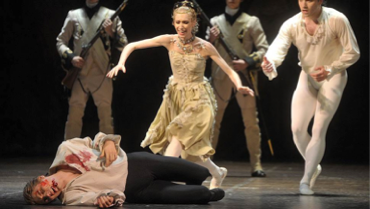 Pity Moscow’s Stanislavsky Ballet - not only unveiling their take on the bodice-ripping world hit of British ballet just a fortnight after the Royal Ballet won raves from the Russians for their own performances of Manon on their Moscow tour, but then losing their wayward star. It’s been reported that Polunin (who found a home in Igor Zelensky’s Stanislavsky company barely two years ago after storming out of the Royal Ballet) quit the production suddenly a fortnight before the premiere, and is now, says Moskovsky Komsomolets's critic, to be a guest star (though the theatre’s website does not yet reflect that). Manon, a potential cash-cow for any company, had been acquired by Zelensky after the huge success of the Stanislavsky staging of MacMillan’s Mayerling, in which Polunin had garnered superlative reviews. Reviewing the Stanislavsky’s Manon, the leading Moscow dance critic Tatiana Kuznetsova offers insightful criticism of the ways that Zelensky’s company ‘russified’ the British drama, not handling its special theatricality and draining the character from it that she appreciated in the Covent Garden performances. But she remarks that the audience did not care - they loved it, and Manon is now to be considered a Russian box office hit, whoever dances it. Incidentally, I see that the Stanislavsky have effectively X-rated the ballet, marking it ‘16 and over’. Kuznetsova wryly noted in her review last month of the Royal Ballet’s committed performing of its explicitly sexual episodes that she wondered how the Russian company would cope in these puritan times in her country. Apropos of which - the Stanislavsky has also given a 16+ rating to Mozart’s Don Giovanni. Just five days before the Manon premiere the star dancer suddenly quit the Stasik roster, taking the status of ‘guest star’. So, for the second night - to which all Moscow had rushed [to see Polunin] - the company called in a Viking, Alban Lendorf, a leading dancer with the Royal Danish Ballet. He cuts a sturdy figure: not tall, with strongly developed muscles on short legs, a pumped-up chest and short neck. In purely technical terms, Lendorf the dancer, with his soft plié, clean and stable turning, strong footwork and powerful torso, is a real treasure for the role of Des Grieux, which is full of slow and highly crafted variations, with intricately braided lines in adagio and desperate overhead lifts. However, his general demeanour, the sanguine outlook and expression of worried benevolence, which remains dominating the artist’s face, does not go well with the image of a nervily infatuated young man. His Manon (who, to be fair, had been chosen to match the fugitive Polunin) was Tatiana Melnik, tiny and flexible, with a supple, deliciously arched foot, quick legs and soft adagio, well-centred turns and excellent upper body. She danced without a hitch, but without real animation. It was absolutely impossible to believe that this girl, with the appearance and behaviour of a well-trained lady’s maid, would also be the seductive but innocent courtesan whom men would shower with diamonds and for whom blood would be spilt. Maybe one should not cavil - MacMillan’s choreography is complicated and to dance it almost without fault is an achievement in itself. But, as it happened, only a couple of weeks ago that same Manon was performed in Moscow by the Royal Ballet of Covent Garden on its tour - and the contrast was striking. In comparison with the Londoners, it was not only the two leads who suffered. One who emerged with honours was the beggar chief (Alexei Babaev), dancing his solo with nonchalant ease and ethereal cleanness. But that adventurer Lescaut, Manon’s brother, was given an incomprehensible interpretation by Dmitri Sobolevsky, spending the whole first act glumly terrorising the rich patrons, like some kind of tax inspector hassling corrupt bankers. Furthermore, not staying with the musical tempo, he drove ahead and messed up his first variation, which demands care with plié and no hurrying in the staccato jumps. The charming Valeria Mukhanova as Lescaut’s Mistress lacked clarity of foot in the little movements or stability in the big turns. The wealthy libertine Monsieur GM appeared, in Stanislav Bukharaev’s performance, rather a jumped-up bureaucrat being offered a bribe in kind, while Mikhail Pukhov as the lusty gaoler was so stiff that it seemed with every tricky step one heard his policeman’s joints creaking. The staging generally has been ‘russified’. Manon is a standard ballet story, but the English version of this genre is notably different from our kind of dram-ballet. Above all, it is extremely realistic, verging on naturalism. MacMillan staged his Manon in times of a general emergence of John Osborne’s’ kitchen-sink drama’, and brought the traditions of his own contemporary English drama theatre into ballet theatre. In his creation, the slaps in the face are telling, hands wrench, seize and grip, almost like in cinema: the leading characters are immersed in the flow of teeming life. The direction of crowd scenes is done with particular precision: each beggar, lady, aristocrat or prostitute has their special character story, and thanks to this the mise-en-scène is full of real and continual action, only part of which is the dance. In Moscow this special English aesthetic has been retouched, this parallel scenario has lost its dramatic distinctiveness, several characters disappeared from sight. The most blood had been lost from the third act: in the port of New Orleans people dressed as ladies and officers filed in rows with the unconcern of mannequins. It’s difficult to say whether the blame for this is down to the English stagers of the ballet, Karl Burnett and Patricia Ruanne, for not working through the ballet’s needs in all details, or to the inert performers - but this Moscow Manon looked rather too much in the manner of an old-fashioned Don Quixote where they dance in the middle of the stage, and the ensemble squeeze around the edges of the stage doing what they can to look animated. Considering that any company will give its maximum commitment to getting the opening performances right, one can presume that the Don Quixoticisation of the Moscow Manon will only grow. And yet, much is fine: the costumes and sets by Nicholas Georgiadis have been meticulously copied -they are rich and lush; the music caresses the ear, the subject-matter is tearjerking, the performers at every level dance plenty and dance diligently. This Moscow Manon is sure to be a box-office hit, despite the absence of the adored Polunin: the Russian public is not snobbish.